Easily build scalable in-app notifications, chat, realtime graphs, and more. Pusher lets you push events to browsers over a WebSocket via a simple API call. 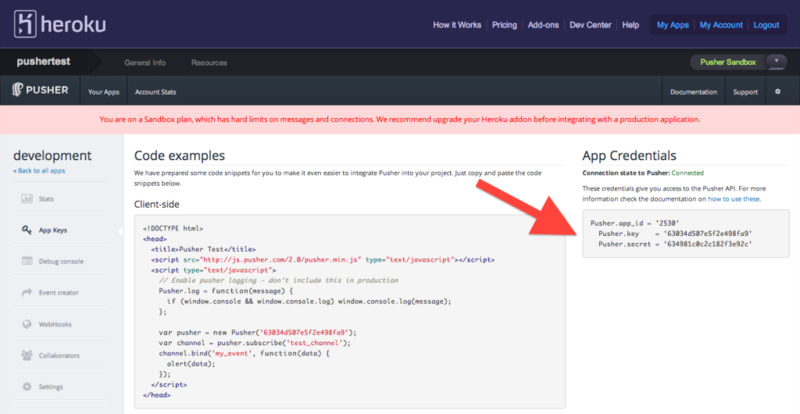 To install Pusher as an addon to Heroku, simply follow the steps below. You can also sign up to the service directly. Lets say you want to “pusherise” an existing Rails 3 app. We’ll assume you’ve already created your app on Heroku. Start by installing the pusher gem, or adding it to your Gemfile. Now every time you push to Heroku your app will be automatically configured to use the “heroku” app created in your Pusher panel. Hopefully this has given you a taste of the great stuff you can do with Pusher. We recommend having a look through our Pusher documentation to get an idea of what else is available. In particular, the section on Debugging is particularly useful. Remember that you have access to your dashboard from within Heroku’s panel.